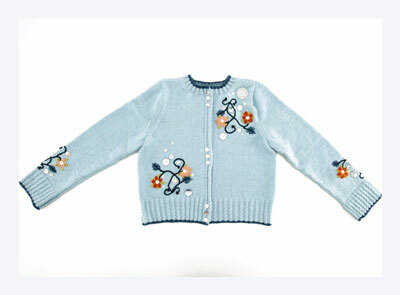 Learn to knit this sweater inspired by the embroidered sweaters of the 1940s. 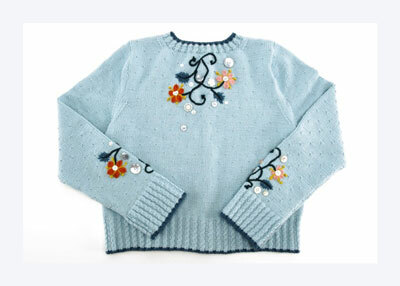 Flora’s embellishment is a simple combination of chain, daisy, and leaf stitches highlighted by French knots. 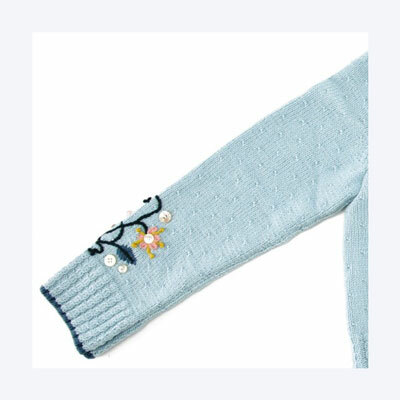 Dainty cables and tipped ribbing add interest to Flora’s edges. With CC1, CO 208 (224, 232, 240) sts. Next row (RS): P1, *k2, p2; rep from * to last 3 sts, k2, p1. Work 2 more rows in rib patt. Change to MC and purl 1 WS row. 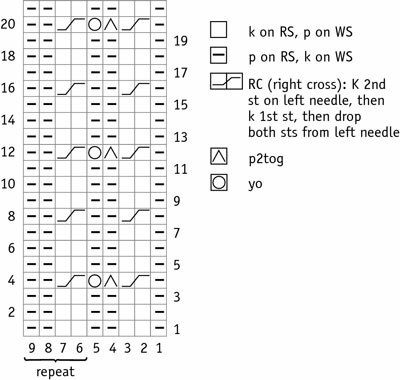 Work rows 1–20 of Cable Edging/Placket Chart. 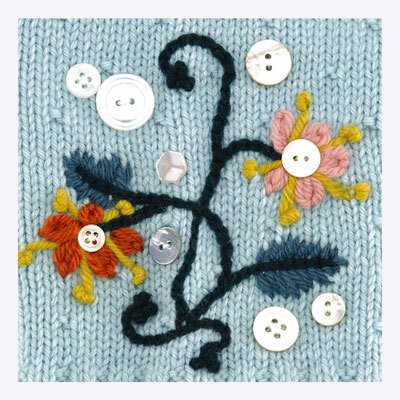 Cont in cable patt (without buttonholes) until piece measures 3″ from CO, ending with a WS row. 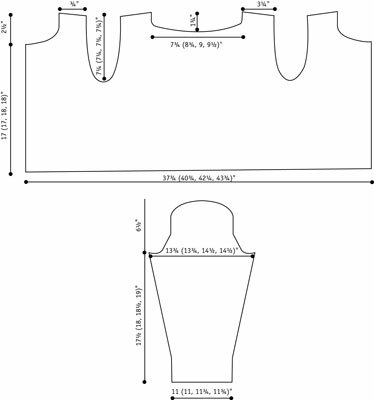 Cable edging and placket chart. Cont working 8 sts at each end of every row in cable patt for plackets. Work all other sts in Main Body patt. Work even until piece measures 8 (8, 8-1⁄2, 8-1⁄2)” from CO, ending with a WS row. Work 2nd set of three buttonholes on right placket. Work buttonholes on right placket only. Work even until piece measures 11-1⁄2 (11-1⁄2, 12, 12)” from CO, ending with a WS row. Next row (RS): Work 47 (50, 51, 52) sts in patt, BO 10 (12, 14, 16) sts, work 94 (100, 102, 104) sts in patt, BO 10 (12, 14, 16) sts, work to end of row — 47 (50, 51, 52) sts for each front, 94 (100, 102, 104) sts for back. Cont working on left front only. Work 1 WS row. Dec row (RS): K3, ssk, work in patt to end of row. Rep dec row every RS row 7 more times — 39 (42, 43, 44) sts. Work even until left front measures 17 (17, 18, 18)” from CO, ending with a RS right cross row. Next row (WS): Work 8 sts and place these sts on a holder, BO next 4 (6, 7, 8) sts, work to end of row — 27 (28, 28, 28) sts. BO 3 (4, 4, 4) sts at beg of next WS row — 24 sts. Next row (RS): *Work in patt to last 5 sts, k2tog, k3. Rep last row every RS row 5 more times — 18 sts. BO 6 sts at beg of next 3 RS rows — no sts. Rejoin working yarn to right front, beg with a WS row. Work as for left front, reversing shaping, and working a set of two buttonholes beg when piece measures 15-1⁄2 (15-1⁄2, 16-1⁄2, 16-1⁄2)” from CO.
Rejoin working yarn to back, beg with a WS row. Work 1 WS row. Next row (RS): *K3, ssk, work in patt to last 5 sts, k2tog, k3. Rep last row every RS row 7 more times — 78 (84, 86, 88) sts. Work even until back measures 17-3⁄4 (17-3⁄4, 18-3⁄4, 18-3⁄4)” from CO, ending with a WS row. Next row (RS): Work 22 sts in patt, BO 34 (40, 42, 44) sts, work in patt to end — 22 sts each side. Cont working on left back only. Work 1 WS row. Next row (RS): *K3, ssk, work in patt to end of row. Rep last row every RS row 3 more times — 18 sts. BO 6 sts at beg of next 3 WS rows—no sts. Rejoin working yarn to right back, beg with a WS row. Work as for left back, reversing shaping. With CC1, CO 80 (80, 84, 84) sts. Work 2 more rows in rib. 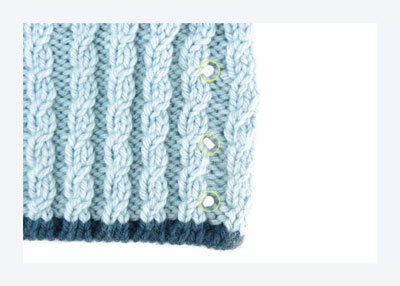 Work in cable patt (omitting buttonholes) until piece measures 3″ from CO, ending with a WS row. Work rows 1–12 of Main Body Chart, dec 20 sts evenly across Row 1 — 60 (60, 64, 64) sts. Cont in patt, inc 1 st at each end of next row, then every 14th row 7 more times — 76 (76, 80, 80) sts. 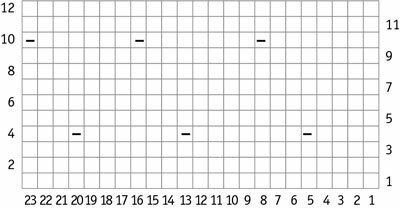 Work even in patt until piece measures 17-1⁄2 (18,18-1⁄2, 19)” from CO, ending with a WS row. BO 6 sts at beg of next 2 rows — 64 (64, 68, 68) sts. Dec 1 st at each end of next 8 RS rows — 48 (48, 52, 52) sts. Work even until piece measures 22 (22-1⁄2, 23, 23-1⁄2)” from CO, ending with a WS row. Dec 1 st at each end of next 4 RS rows—40 (40, 44, 44) sts. BO 5 sts at beg of next 8 rows — 0 (0, 4, 4) sts. BO. 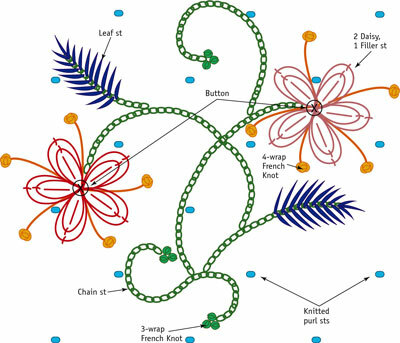 Work embroidery as shown, foll Flora patt, inverting patt on upper left front and center back. With RS facing, MC, and working along neck edge, work 8 held placket sts in patt, pick up and knit 108 (116, 120, 124) sts along neck edge, work 8 held placket sts in patt — 124 (132, 136, 140) sts. Next row (WS): K1, *p2, k2; rep from * to last 3 sts, p2, k1. 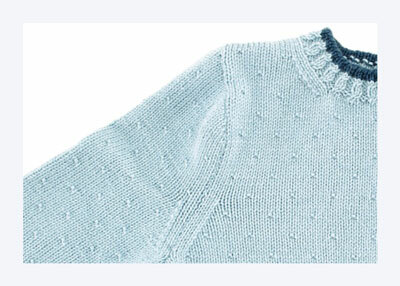 Work rows 3–7 of Cable Edging/Placket Chart, including buttonhole on right front. Change to CC1 and work 2 rows in k2, p2 rib. BO in patt. Sew embellishment buttons in place as shown. Sew placket buttons in place, under buttonholes. Steam embroidery lightly to block.